The Large Cottage Painted Scroll Chest is truly a work of art. 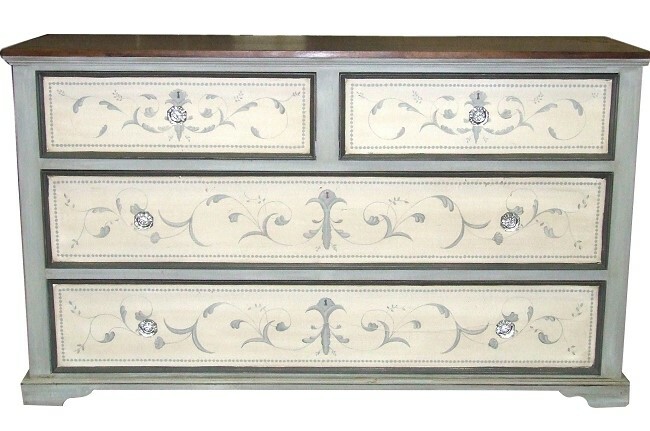 The Hand painted chest exudes a timeless subtle beauty that never goes out of style. Custom made for you from 100% wood, typically mahogany. Features dove-tailed, self-closing full extension under mount drawer glides. Measures 72"W x 42"H x 22"D and shown in French Gray with Sandstone and Chocolate Accents with Dark Stained Wood Top .